1) Describe key stages in the process in a logical order, making comparisons where appropriate. 2) Use suitable words and phrases to structure and link the process clearly. 3) Remember to include an overview summerising the main features of the process. 4) Vary your vocabulary and use your own words as far as possible. 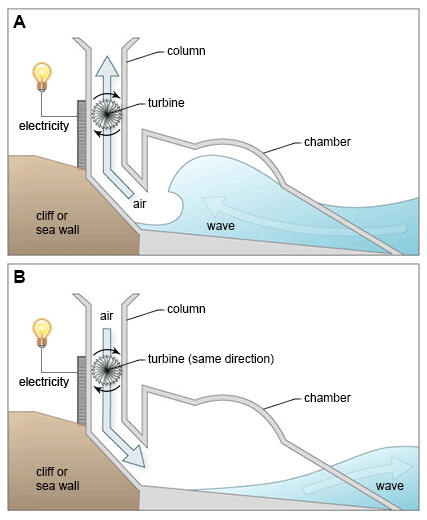 The two diagrams show how electricity can be generated from the rise and fall of water caused by sea waves. The process involves a structure which is mounted on the side of a cliff or sea wall. This structure consists of a large chamber. One end is open to the sea, and the other leads into a vertical column, which is open to the atmosphere. A turbine is installed inside this column and this is used to generate the electricity in two phases. The first diagram indicates that when a wave approaches the device, water is forced into the chamber, applying pressure on the air within the column. This air escapes to atmosphere through the turbine, thereby producing electricity. The second diagram illustrates the next part of the process when wave retreats. As the water level falls, the air from outside the column is sucked back in through the turbine. As a result, electricity continues to be generated. The turbine rotates only in one direction, regardless of the direction of the air flow. In conclusion, we can see that this structure is useful as electricity is generated in both phases: entering and retreating of water.